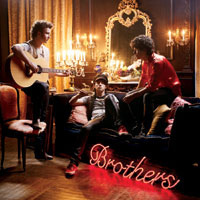 "Tonight" is the third single by the American pop band Jonas Brothers from their third studio album, A Little Bit Longer. Fueled by digital downloads, the song debuted at #8 on the Billboard Hot 100 songs chart on August 7, 2008. The song's official single release was confirmed at the 36th Annual American Music Awards. They also performed the song later that night during the show. They have confirmed that filming for the music video is complete and it will be sent to mainstream radio in early January. The song was released on January 4, 2009 and the music video was released on January 19, 2009. The Jonas Brothers' third studio album, A Little Bit Longer, was released in the United States on August 12, 2008, with CDVU+ technology, just like their second album, Jonas Brothers. On June 24, 2008, iTunes announced that it would release four songs from A Little Bit Longer, one roughly every two weeks. The purchase of each of the songs applies to the cost of the entire album, which could be purchased via iTunes' Complete the Album feature after release. Each song released also featured a podcast. The schedule: June 24, 2008 for "Burnin' Up"; July 15, 2008 for "Pushin' Me Away"; July 29, 2008 for "Tonight"; and August 5, 2008 for "A Little Bit Longer." All of them have occupied the number 1 spot on iTunes for at least 3 days.